I’m a bit late with this report on the upcoming Cinema Ritrovato festival at Bologna, but frankly the Bolognese are all too good at hiding the information on their website (come on guys, it’s not even listed on your calendar). Anyway, the festival takes place 26 June-3 July, and as usual the festival’s “memorable eight days” brings together a remarkable range of archive films from the silent and sound eras, maintaining its well-deserved reputation for catholicity, scholarship and quality presentation. The major silent cinema elements are the traditional centenary survey of a year of cinema which has now reached 1910; the start of a retrospective of proto-auteur Albert Capellani; all of John Ford’s surviving silents; and cross-linking with the Women and Silent Screen conference, also taking place in Bologna. 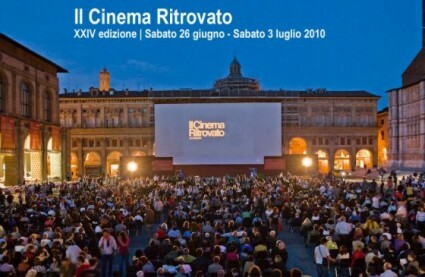 Bologna’s eight days and nights of cinephilic paradise from June 26 to July 3 will take place in four locations: the twin screens of the Cineteca’s Lumière cinema, one dedicated to silent cinema (which will feature images of life from exactly 100 years ago) and the other to sound, showcasing, for example, little known films of Italy as it was during the period 1945-48; the Arlecchino cinema, a haven for films requiring the size of a larger screen; and of course Piazza Maggiore, which will host splendid restorations like Visconti’s Il Gattopardo brought by the Film Foundation, or the new complete version of Lang’s Metropolis, for whom we can thank the Murnau Stiftung and Stiftung Deutsches Kinemathek, with the original score by Gottfried Huppertz, performed by the Orchestra of the Teatro Comunale di Bologna conducted by Frank Strobel. What a wonderful surprise it will be to rediscover the films that started it all – the first actuality films, street views, masterpieces by the Lumière brothers bristling with their newly restored beauty thanks to the Institut Lumière in Lyon. Another important name in American cinema and festival protagonist, Stanley Donen, will be our guest this year, more than sixty years after his debut with On the Town and more than fifty years after the golden age of musical ended – after which Donen continued his career beautifully with his personal brand of elegant comedy (Charade, 1963, and Two for the Road, 1967). And of course the best known and loved of them all, Singin’ in the Rain (1952), will be shown in Piazza Maggiore. As for the film world surrounding Chaplin, this year the spotlight is on Robert Florey, an eclectic, talented Frenchman in Hollywood who was the assistant director of Monsieur Verdoux. Though the larger part of his work was routine, Florey created films that were incredible for their experimental audacity and their "tender madness" much loved by Luis Buñuel: The Life and Death of 9413 – A Hollywood Extra (1928), a film version of Poe’s Murders in the Rue Morgue (1932) and The Beast with Five Fingers (1946). Further information on the festival is on the site, in Italian, though there is no day-by-day programme (that I can find). Also worth seeking out on the site is a list of every film featured at the festival 1986-2009 (in Excel spreadsheet form) giving title, date, country and director, plus PDFs of festival publications and its DVD award winners 2004-2009. All wonderful stuff – once you can find it.